"Building Church; building lives!" is the motto of the Christian Families of Our Lady of the Poor Foundation. Taking its inspiration from the words Mary revealed to Mariette Beco,"I came to alleviate poverty" and "I would like a little Chapel", the logo delivers subtly but effectively the mingling of the two marks of an active Christian witnessing - faith and action; Church and life. The Filipino family is the main recipient of this foundation; it is to intimately link itself with the Blessed Mother. 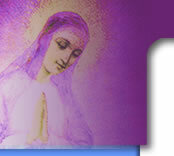 Through our Lady's intercession, all families would be unite with God and with one another. The circle is a symbol not only of an unbreakable unity; it also connotes perfect holiness, as very family will be called to build their lives in unity with the highest perfection - God the Father, in Jesus Christ, and through the Holy Spirit. The outward motion of the circle is always a call to evangelize; they are not to serve themselves. The presence of the colors connote universality - peace (blue), life (yellow and green), and passion (red). Each family served by the foundation becomes an active evangelize by helping other families free themselves form the shackles of poverty and sin. Thus, the foundation started the Church construction, but eventually, the future of the poor and our the children depends on it.